A few years ago, seeing a drone pass through the village was a novelty. However, with their boom in popularity they have come to be seen as an annoyance (best case scenario) or a threat to public safety (worst case scenario) thanks to inexperienced and amateur pilots. Just in the past few months I’ve seen two drones crash into buildings in Riomaggiore (and I’m sure this is just the tip of the iceberg, especially considering that there are five villages). Before you pack your drone and plan to use it in the Cinque Terre there’s a few things you should know. In order to *legally* fly your drone here, you’ll need written authorization from two different entities: The Cinque Terre National Park and ENAC (l’Ente Nazionale per l’Aviazione Civile). And given the bureaucratic nature of Italy, that’s no easy feat. 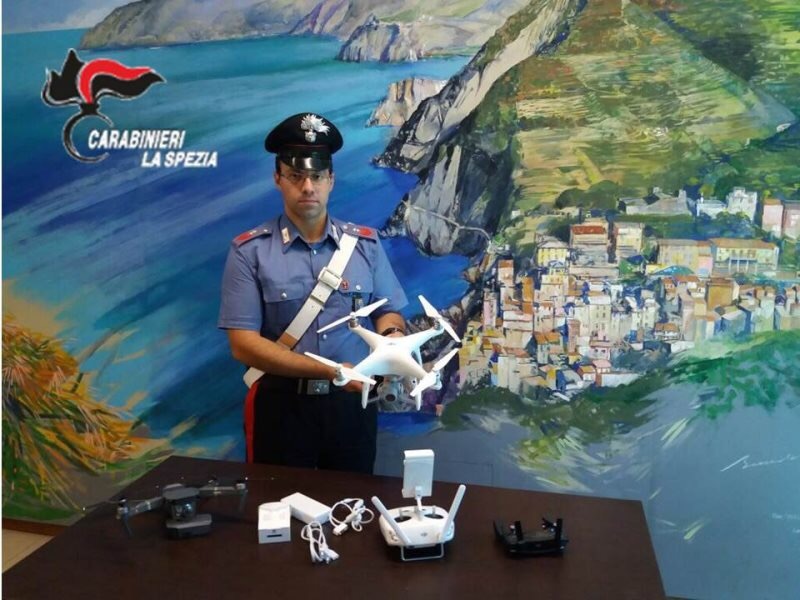 What laws are you breaking by flying your drone in the Cinque Terre without the necessary authorization? Articoli 1.231 e 1.216 del Codice della navigazione (pilotaggio e impiego di un sistema aeromobile a pilotaggio remoto sprovvisto di attestazione di pilota rilasciato dall’Enac sprovvisto di certificazione di inoffensività) e l’articolo 11 comma 3 lettera h della legge 394 del 1991 (sorvolo su area marina protetta senza la prevista autorizzazione del Parco Nazionale delle Cinque Terre). So, you’ve decided to be a rebel and plan to use your drone anyway? Know that if you’re caught by local authorities (and FYI they’ve been cracking down as of late) your drone will be confiscated and charges will be pressed. Is it worth the risk? That’s for you to decide. But don’t say that I didn’t warn you. We were planning a trip for next year and one of the major reasons I wanted to visit this area was so I could capture video/photos of its beauty with my drone. I had planned on flying out over the water and not over the towns themselves. 1. Is only flying over the building the issue or flying at all? 2.) If I cannot fly at all, then it’s a big enough deal to us that we’ll probably pass on the Cinque Terre and extend our stay in Tuscany instead. Italy is a land of a gazillion laws. So many, in fact, that it seems like Italians pick and choose which ones they want to abide by. Jokes aside, if you were to follow Italian law 100% you wouldn’t be okay to use your drone in Tuscany, either (as you’d need to have authorization from ENAC and this is a *national* requirement, so all throughout Italy). The only extra hoop to jump through to legally fly your drone in the Cinque Terre versus elsewhere in Italy is that you’ll also need authorization from the national park (which I imagine is a cinch compared to ENAC). With all that said, I think you’d have to be quite unlucky (or just oblivious) to be cited and have your drone confiscated. There have been three incidents where this has happened so far this year and I’m guessing at least a thousand drone flights, so the odds are in your favor. If you plan to fly outside of the village centers your chances of being cited are even slimmer. I do, however, think it’s important for people bringing drones to know the local laws so they can make their own judgement calls (hence my blog post on the subject).